The Caps are going to win the cup because of their strong...defense? That's right, you read it right. With their 3-1 victory over the Vegas Golden Knights on Saturday, the Washington Capitals are merely 2 wins away from hoisting Lord Stanley's Cup thanks to some impressive defensive play. Don't get me wrong, the Washington offense is also getting it done. But arguably for the first time in the Ovechkin era of the Caps, the team is playing some solid D to back up the scoring. Of all the stats from game 3, the one that stands out the most (other than the score) is the number of shot blocks from the team in red. The Caps blocked 26 shots to Vegas' 9 and if you watched the game- it was apparent. The Golden Knights had their opportunities and entered the zone many times, but it almost always ended the same way. One after another, their offensive pushes would be foiled due to yet another wide-angle shot bouncing off a Capital's skater. This suffocating defensive play by the Caps is new behavior for them historically, but it has been working well for them in these playoffs. Caps fans may have seen a similarity in last night's play and with that of games 6 and 7 in the series with the Lightning. 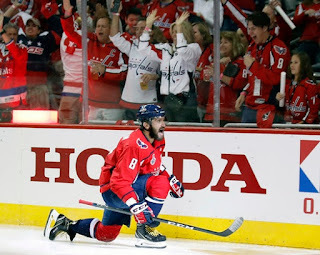 In all these cases, Washington took a 2-3 goal lead, then relied on a shutdown style defense (plus the amazing play of Braden Holtby) to get the job done. It's totally possible that this could still go 7-games, but if Vegas doesn't find a way to get the puck on Holtby; this could be over sooner rather than later.